Freiburg Germany is located in the sunny southwest, on the western edge of the black forest. It is an attractive and relaxed city with a high quality of life, for citizens and visitors alike. If I ever had to move within Germany, Freiburg im Breisgau would be the place to go. Except for trams and bicycles, the city centre is free of traffic, it is one huge pedestrian mall. Take a leisurely stroll along the picturesque alleys which are paved with wonderful mosaics and lined by Freiburgs famous Bächle (small water channels). Explore impressive old buildings, first of all the famous Münster, the old and new town hall and the Hotel Zum Roten Bären - Freiburg is full of history. But it is not only the history that makes Freiburg so attractive. 30,000 students in one of Germany's oldest and most reputable univesity add to the cities bustling but still relaxed lifestyle. Here is an overview of the topics on this page. Come and discover one of my favourite German cities with me, you won't regret it. Freiburg was established in 1120 as a free market town at a junction of trade routes which connected the Mediterranean Sea with the North Sea and Baltic Sea. 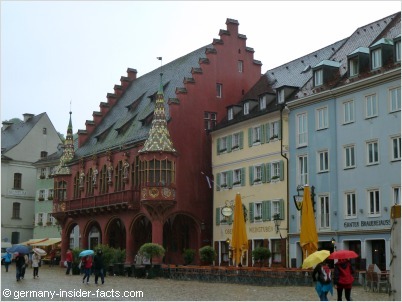 The name Freiburg can be roughly translated as "free fortified town". It was not easy for the citizens of Freiburg to defend their freedom and independence over the centuries. Founders were the dukes Bertold and Konrad of Zähringen, members of a noble family in the area. When the Zähringer family died out, the unloved counts of Freiburg tried to cut the freedom of Freiburg's citizens. 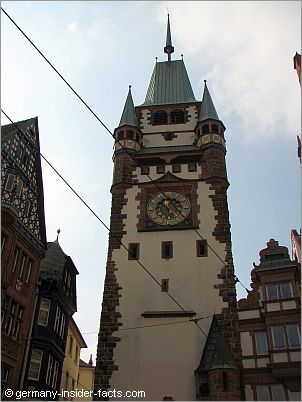 After several fights with their rulers, Freiburg bought its independence from the lords in 1368. Under the protection of the Habsburgs the city could keep a wide range of freedom. Silver findings in Mount Schauinsland made Freiburg one of the wealthiest cities in Germany and Europe. When the silver run out in the mines at the end of the 14th century, Freiburg turned its focus to culture and science. Albert-Ludwigs-University was founded in 1457. It is one of the oldest and still is one of most reputable universities in Germany. 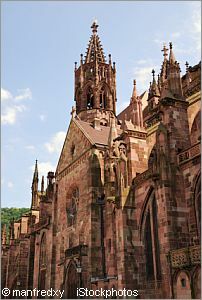 Freiburg didn't join the Reformation, it remained a strong centre for Catholicism in the southern rhine area. The Archdiocese was founded in 1827, the minster has been the seat of the archbishops since then. The Thirty Years' War (1618 - 1648) was a major setback for Freiburg. The number of citizens decreased from over 10,000 to around 2,000 by the end of the war. Until 1805 Freiburg belonged to various states of the German Confederacy and other European countries. 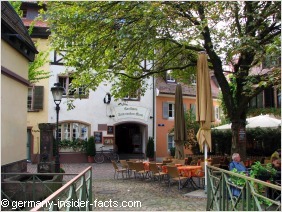 Finally, in 1805 Freiburg became a part of Baden which is a part of Baden-Würtemberg today. During the Nazi regime Jewish citizens of Freiburg were deported to a camp in Southern France. Those who survived the poor conditions were sent to death at Auschwitz in 1942. Brass plates in the pavements of Freiburg's streets remember of individual vicitms. In November 1944 the city centre was heavily damaged by RAF bombers. Thankfully, the old town was rebuilt on the medieval plans. Climate - Freiburg is one of the warmest cities in Germany, with an average of 1700 hours sunshine a year. However, precipation is also above average with May and June being the wettest months. Nevertheless, when you watch a weather report in Germany, Freiburg's weather is very often the best in the country. The minster and the historic buildings are the obvious highlights of a sightseeing tour in the old town centre. But there is more than that. Whether you walk around the bustling streets and places for a great shopping experience, or you roam the hidden lanes and alleys, I am sure you will discover your personal Freiburg attractions. Freiburger Münster - The minster was built between 1200 and 1530. It was not damaged in WW II. However, the fragile sandstone has been suffering from climate and environmentally impacts, so renovation & restoration is an ongoing project. You are very lucky when you see the cathedral with the prettiest tower of Christianity (as it was once called) without scaffolding. The facades are decorated with pinnacles, gargoyles and figures of kings, apostles and saints. Münsterplatz (minster square) is the largest square in the city, surrounded by beautiful buildings. 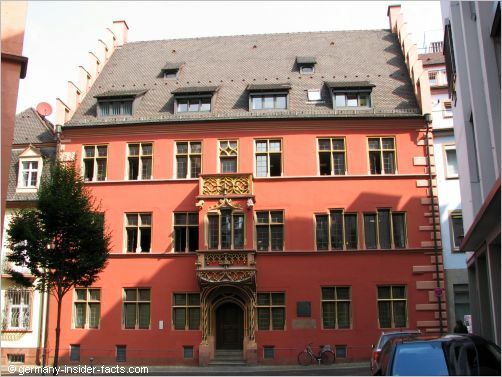 The red historische Kaufhaus (historic merchants hall) is a beautiful building, decorated with colourful bay windows and statues of four emperers. The Kornhaus on the northwestern corner of the square is another prominent historic house. A market is held on the minster square on weekdays from 7:30 to 13:30. On the southern side of the square general merchants offer their goods, while on the northern side local producers sell fruits and vegetables of the season. Feeling hungry? There are many cafes & restaurants on the Münsterplatz. However, when you visit while the market is running, you should try the famous Münsterwurst, or lange Rote. This famous sausage is served with (mit) or without (ohne) onions, your choice. Just order "eine lange Rote mit / ohne". 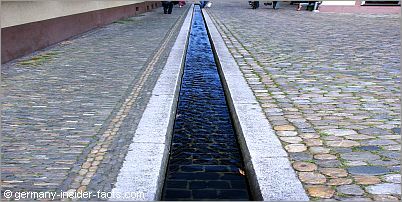 Freiburg's famous Bächle are a system of gutters, or small channels, that line the streets in the city centre, providing a cooling effect on hot summer days. The constantly flowing water is diverted from the river Dreisam. Kids love to splash around in the Bächle, or let little boats sail away. I admit, on hot days I was tempted to kick off my shoes and wade in the water. Schlossberg (castle hill) is the birthplace of Freiburg, right on the edge of the city. The Schlossbergbahn brings visitors from the city centre to an amazing vantage point within three minutes. There are walking trails, a restaurant, and you can climb the tower for even better views. Schwabentor (Swabian Gate) and Martinstor are remainders of Freiburg's fortification. Schauinsland - 1284 m above sea level (literally look at the land) offers stunning views over the black forest, even to the Alps (if the weather is fine) and to the Rhine Valley. You can drive to the summit by car, but also use the cable car from Horben to go up to the summit. Horben can be easily reached from Freiburg by tram and bus. 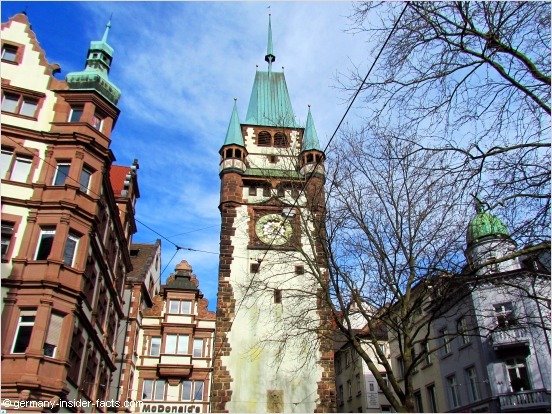 Freiburg offers museums and art, history, shopping, nightlife and fantastic food. Whatever you are looking for, Freiburg won't disappoint you. You can guess from the food section of the black forest main page that I really enjoy the local cuisine (badische Küche). When you wander around Freiburg's streets and alleys in summer, the lovely smell of food is inviting. Beergardens, cafes, restaurants and wine taverns offer outdoor seating at picturesque squares and inner yards. Whether you prefer wine or beer, you'll find your favourite place. What's my favourite place? This is hard to say. 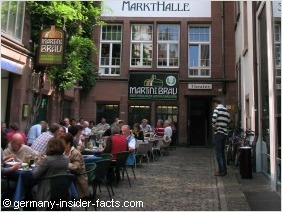 I like to sit in the small lane in front of Martinsbräu brewery, or wander through the Markthalle with the local & international food stalls. Any locality that offers traditional badische specialities is the right place for me. After all, I can have a pizza at home as well, so why travel to Freiburg for a pizza? This map covers roughly the city centre in Freiburg. You can zoom in and zoom out to see more details, or get an idea how big Freiburg is. On my first visits to Freiburg I never realised that it is a fairly big city, because the city centre is such a cosy and relaxed place. Now don't you long to visit sunny Freiburg im Breisgau? Freiburg is conveniently located on the motorway A5 which goes from Frankfurt to Basel. Travelling to Freiburg by train is also very easy. The Rheintalbahn from Mannheim to Basel (via Freiburg) is a major railway line with good ICE train connections to and from major cities in Germany. When you arrive at the airport in Frankfurt, you can jump on a direct train to Freiburg from the long distance train station at the airport. The choice of hotels in Freiburg is huge, with a wide range of options. From a small, familiar guesthouse to a large business hotel, the choice is yours. Use the search box below to compare offers and find the best deal. Read traveller reviews about Freiburg Hotels at Tripadvisor. Sunday & public holidays 10am until noon. From 1st October to 31st Mai the centre closes at 6pm during the week and 2:30pm on Saturdays. The tourist information centre offers brochures and info about the city and the black forest, as well as souvenirs.